I love going to author events and meeting my favorite authors. It's a chance to get to know them better, ask questions, show your support AND have your books signed. The authors that I enjoy meeting are usually at indie bookstores so it's also a chance to visit new bookstores and to buy a few new books. Really, who can visit a bookstore without at least one purchase? 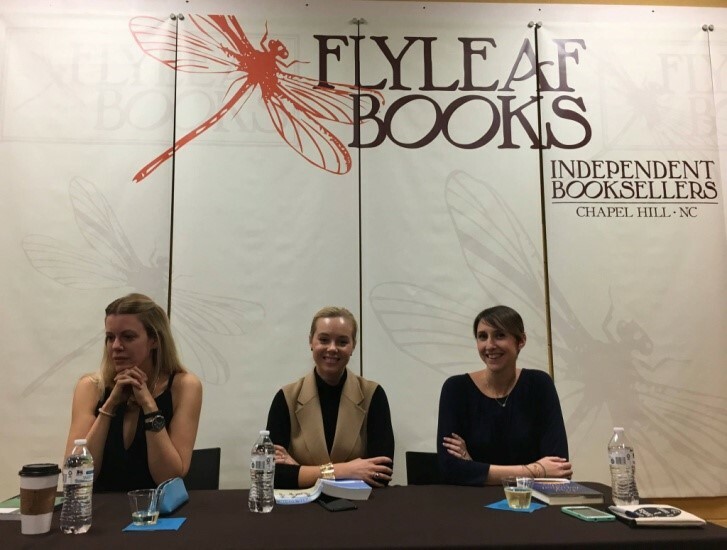 I was lucky enough to have two author events close to me during a week in November and was able to attend them both. 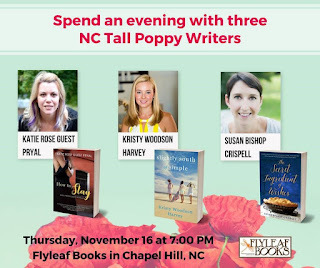 I had met Kristy Woodson Harvey in the past but Katie Pryal and Susan Crispell were new authors for me. All three authors read from their newest books and talked about what they were working on. They also talked about things like when they write, how they find the time and other pressures in life that keep them away from their writing time. All three of them write first thing when they get up in the morning and try to avoid social media in their mornings. Susan works a full-time job so she writes in the morning, at lunch and when she gets home from work. Buy The Secret Ingredient of Wishes by Susan Crispell at Amazon. Katie has children and she homeschools so she has even more problems finding time to write. Buy How to Stay by Katie Rose Pryal at Amazon. Kristie waits until her son goes to school in the mornings and then writes. Buy Slightly South of Simple by Kristy Woodson Harvey at Amazon. Another interesting thing that they talked about was when they started writing and when they knew that they wanted to be a writer. It was an interesting and fun event with a lot of laughs and great talk about books. This time I was familiar with two authors Bren McClain and Donna Everhart. Danny Johnson and Travis Mulhauser were new authors to me. First, each author told a little bit about their current books and then a moderator asked questions of the panel. There were a lot of authors in the audience so many of the questions were about what software they used and their editing process. All of the authors talked about what they were working on now, their writing process and their path to getting published the first time. It was all very informative and interesting. To me, the most interesting part of the presentation was when each author talked about what first drew them to the story behind their current novel and how much (if any) their books were a reflection of their lives. They each talked about their struggles when they first started writing and their writing process now. Buy The Last Road Home by Danny Johnson at Amazon. Buy One Good Mama Bone by Bren McClain at Amazon. 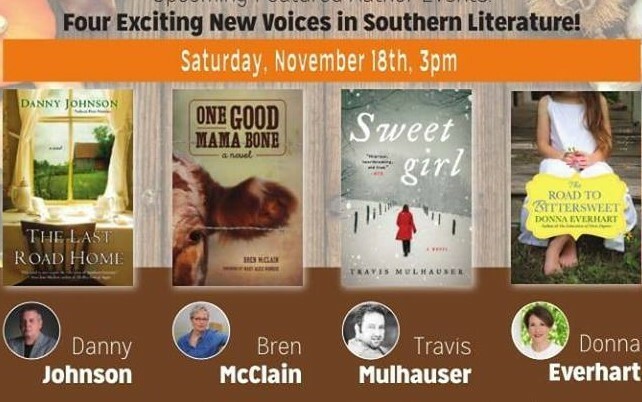 Buy Sweet Girl by Travis Mulhauser at Amazon. Buy The Education of Dixie Dupree by Donna Everhart at Amazon. For me this week, I met 4 new authors and re-connected with 3 authors, bought 4 new books and got all of my books signed. 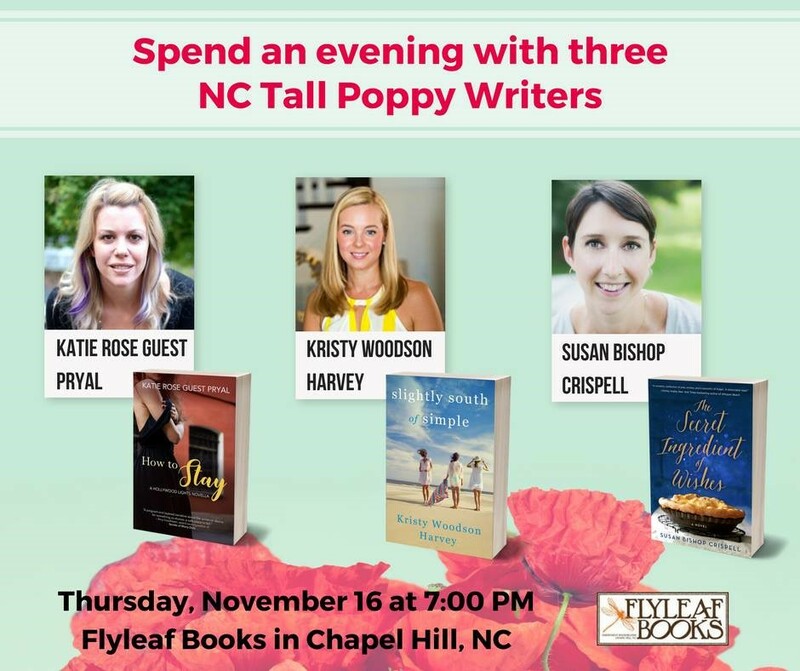 I thought that it was all fun and informative and am keeping my eye on our local newspaper to see when other authors will be close to me so I can attend their author events. How about you - do you attend author events? Would you, if there were closer? I must admit that both of these were an hour drive but I felt that it was well worth it.